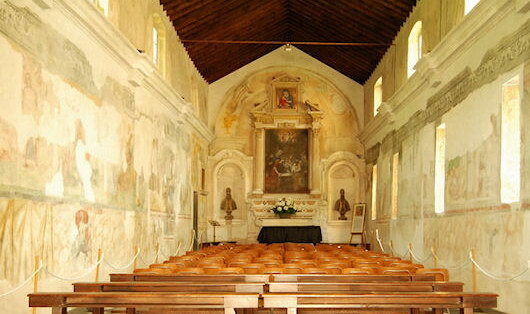 The Oratory, with its thousand years of history, stands within the village's oldest settlement. Placed in close proximity to the Church of Santa Croce, it comprises, at present, an open entrance and a rectangular hall, 26 meters long and 7 wide, covered by a wooden truss roof. The Oratory, of relevant value in itself, is further enriched by the frescoed walls within, which present stratifications of arriccio –a fresco's rough underlayer– from different time-periods.